The water and air are warming. The sun shines down from blue skies. And visitors are starting to trickle back onto Folly Beach after a long winter. With the start of Spring come lots of fun Folly events that celebrate the time of year and the start of summer. 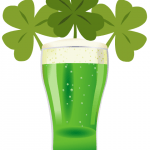 Brush off your luck of the Irish and put on your favorite green shirt for the St. Patricks Pub Crawl on March 16. With proceeds benefiting the Surfrider Foundation, Save the Light, and Folly Angels, youll be drinking green beer for great causes. Crawlers can buy a ticket at any participating restaurant or bar: Loggerheads, Woodys Folly Brew Pub, Drop in Deli, Planet Follywood, Folly Beach Crab Shack, The Grill on the Edge, Blu, and Ritas. Then, the ticket gets punched at any of the six spots. Lucky Irish who get their ticket punched everywhere can win prizes. The fun runs from 1 to 5 p.m. 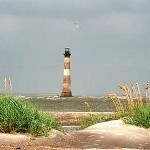 The Morris Island Lighthouse is a Folly Beach landmark, and the 15th Annual Save the Light Gala and Silent Auction will help raise the money to maintain and preserve the light. This years gala will be held on March 28 from 6 to 9 p.m. at the TIDES. This years theme is Folly-ritaville, so put on your very best beachwear. The silent auction will include awesome items like a guitar signed by Edwin McCain, art by Jim Booth and Steven Jordan, custom jewelry, and vacation packages. Visit SaveTheLight.org for more information or tickets. The Easter Promenade has become something of a Folly tradition. Women, men, children, and their pets are all encouraged to put on their Easter bonnet for a stroll down Center Street on March 30. The walk will go from the Community Center to Ashley Avenue. Golf carts will be used for those who need extra assistance, but please call in advance. For more info, call Charlotte Goodwin 843-588-9955. The Baptist Church Easter Egg Hunt will follow the promenade, from 12 until 2 p.m. at Folly River Park. 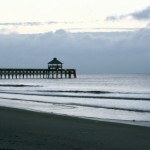 The three Folly Beach churches are celebrating Easter together with a Sunrise Service on the Folly pier. The service begins Easter morning, March 31, at 6:30 a.m. A choir made up of choir members from each church will sing, and church leaders will perform the service. This celebration is in addition to each of the churches regular Easter services.